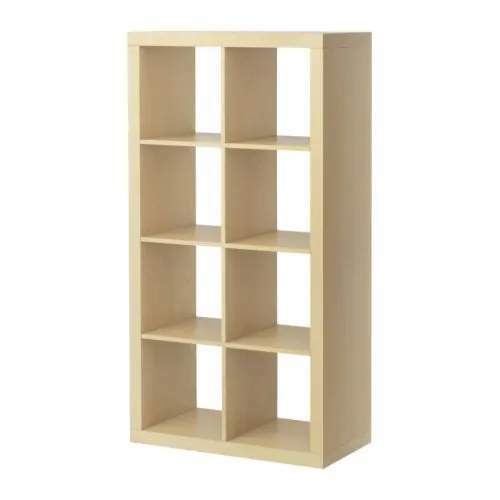 IKEA cube bookcase, 4x2 squares, EXPEDIT - usually £50-ish, now only £29! EXPEDIT is usually somewhere in the region of £50 but currently they are reduced to just £29. That is a fab price for one of these. Ok, they're really common but they're good strong units, and Habitat sell something that looks very similar for about 10 times the price. Fab for kids bedrooms and simple to build up (or if you're more adventurous you can adapt the sizes of the cubes to make some rectangles!). Available in birch, white or black/brown. It is only the unit that's 4 squares by 2 squares that's this price, although there were also reductions on other LACK items to match when I was instore yesterday at Leeds. Stands vertically or horizontally. Can be fixed to the wall if you've got kids likely to pull it over on themselves or if you want to use as a room divider. Holds 12" vinyl & A4 files. i was looking at that very thing in IKEA gateshead just last night. it seemed a little bit wobbly for my liking, but that was probably be because it was a display model. plus, you would probably attach this to the wall making it completely solid. i was looking at that very thing in IKEA gateshead just last night.it … i was looking at that very thing in IKEA gateshead just last night.it seemed a little bit wobbly for my liking, but that was probably be because it was a display model.plus, you would probably attach this to the wall making it completely solid. Probably just the display. The larger 5x5 units can be a bit wobbly - had one of those collapse on me when trying to move it, but we've got 5 of these 4x2's dotted around the kids bedrooms, playroom and study and they're really strong. They do come with fixings so you can stick it to the wall. They do of course provide a fixing to attach it to a wall and prevent any chance of it toppling onto you. PLUS don't forget you can use it not as a 4 high x 2 wide but as a 2 high x 4 wide (all the external sides are finished) which is how mine's used. They also sell several 'baskets' designed to fit into the holes - ranging from natural woven, to coloured plastic ones. Got mine when they were discontinuing the Beech ones a year or so ago (gone out of fashion it seems) and price was cut by a similar amount. They do of course provide a fixing to attach it to a wall and prevent any … They do of course provide a fixing to attach it to a wall and prevent any chance of it toppling onto you. PLUS don't forget you can use it not as a 4 high x 2 wide but as a 2 high x 4 wide (all the external sides are finished) which is how mine's used. 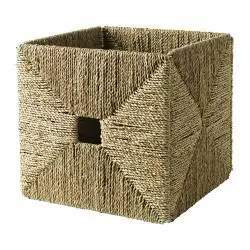 They also sell several 'baskets' designed to fit into the holes - ranging from natural woven, to coloured plastic ones.Got mine when they were discontinuing the Beech ones a year or so ago (gone out of fashion it seems) and slashed it by a similar amount. Also available in black with red handle. I've got the same thing but 4x4. Agree with the above that it needs to be held in place if kids about. 4x4 is very solid but maybe because it's wider. It also says these offers aren't available in Cardiff or Edinburgh! I seem to remember seeing this in the IKEA family emailThey also have the … I seem to remember seeing this in the IKEA family emailThey also have the Lack side tables which go quite nice with these at 3.99 instead of 7.82It also says these offers aren't available in Cardiff or Edinburgh! I have two of the white ones of these, quite simple to build and very solid. I paid £50 and I thought they were a bargain, even better at £29! that's not fair is it?! :? We have 2 of the twice the size versions and they are fantastic good quality units. The tesco black value crates for about 97p are the cheapest and best boxes to fit inside, we struggled everywhere to get the right size boxes but these ones fit perfect. Just wish I had an Ikea nearer to get the smaller set for little uns bedroom! Balls! Bought one of these only a couple of weeks ago for the full price. If I had the packaging I'd take it apart and take it back for a refund! Balls! Bought one of these only a couple of weeks ago for the full … Balls! Bought one of these only a couple of weeks ago for the full price. If I had the packaging I'd take it apart and take it back for a refund! Now that is a quality idea! Shame on me for lacking such cunning. If these are the size I think they are, then the cubes are PERFECT for vinyl. One for the record nerds. If you're going there anyway why not just buy a fresh one at the lower price and wheel it around to the returns with your old receipt (assuming the returns queue isn't too long)? It isn't as if you're cheating them - they have a 90-days full refund policy and you bought one within the 90 days (fairly sure it is still 90) and are returning one for a refund of what you did pay. If anyones interested I actually wanted to get rid of my black one, but seeing as they're now only £29, I'll probably give it away for £10. Pick up only, if you live near Romford Essex. If these are the size I think they are, then the cubes are PERFECT for … If these are the size I think they are, then the cubes are PERFECT for vinyl. One for the record nerds. Thats what I was thinking....do vinyl fit in these? great can someone tell me all the choices of baskets I can fit in it please from Ikea??? got my receipt here and it's 90 days to return for a full refund if product unopened, if opened then they take off 30%. Examples of a failure to take reasonable care of goods may include if you use the goods, if you assemble or part assemble the goods or if you remove the goods from their packaging and fail to properly repack them. If your failure to take reasonable care of the goods means that they cannot be resold as new we reserve the right to apply a charge of 30% of the price you paid for the goods, which you agree we may discount from your refund for the goods. We can only re-sell opened, assembled or used goods in-store at a significantly discounted price and the 30% charge is your agreed contribution to our likely loss on these goods. 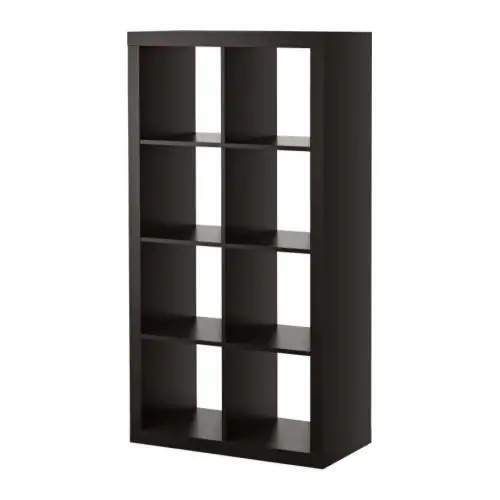 damn, i bought this very bookcase last week for full price! anyone know what size baskets fit in? hot fromme . i bought 2 about 2 years ago, still very solid but paid about 50 each. they are perfect for anyone with a 12" vinyl collection, and also i've got one on its side which i use as a DJ stand, easily enough room for 2 x Technics 1210s and a mixer. If anyones interested I actually wanted to get rid of my black one, but … If anyones interested I actually wanted to get rid of my black one, but seeing as they're now only £29, I'll probably give it away for £10. Pick up only, if you live near Romford Essex. If you want to 'give it away' to me, you can. But I'd want a bit more than £10 to collect. Would you be prepared to go to £15? They do of course provide a fixing to attach it to a wall and prevent any … They do of course provide a fixing to attach it to a wall and prevent any chance of it toppling onto you. PLUS don't forget you can use it not as a 4 high x 2 wide but as a 2 high x 4 wide (all the external sides are finished) which is how mine's used. They also sell several 'baskets' designed to fit into the holes - ranging from natural woven, to coloured plastic ones.Got mine when they were discontinuing the Beech ones a year or so ago (gone out of fashion it seems) and price was cut by a similar amount. I have got this exact one in birch effect. Its a great bookcase. Really solid - I used the supplied wall fixings, which keep it very sturdy. Was a little tricky to put together, I would say you are better off doing it with a friend. But a nice unit, I am wondering if I should get another at this price. It cost me £49.00 back in the summer. I bought some of the mentioned boxes separately which fit perfectly in the holes. The first of these is the exact size. Most of the others are quite a good fit, but there may be a cm or two of a gap. er...and probably a few others. hot fromme . i bought 2 about 2 years ago, still very solid but paid … hot fromme . i bought 2 about 2 years ago, still very solid but paid about 50 each.they are perfect for anyone with a 12" vinyl collection, and also i've got one on its side which i use as a DJ stand, easily enough room for 2 x Technics 1210s and a mixer.top price! They also hold A4 folders/files well. We've got one in the study and it keeps loads of junk out the way. For kids bedrooms and garages - use industrial shelving. Its basically indestructible, and far less likely to fall over when kids decide its a mountain to be conquered. Also - sadly there will be lots of it going for next to nothing compared to the new price as the credit crunch brings in the receivers in many places. 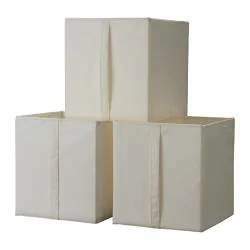 I've got one of these on it's side, we use the sofa as a room divider and this is against the back of the sofa, they are great, build quality is good and the a lot of different ikea boxes fit inside, the plastic ones are a bit pricey but you can always buy just 2 or 3 and have them at random places to make it look interesting. I find it really convenient, vinyls fit as do laptop bags, books, boxes of magazines, files and paperwork. Definitely hot at this price! 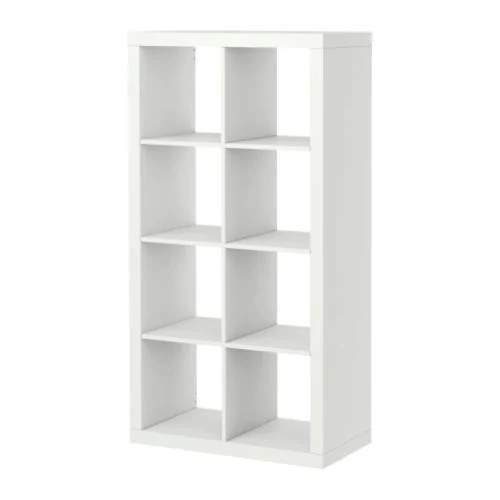 Btw, IKEA Fmily members could buy one of the following boxes at the same time as this bookcase and get 2 free. Yes, that's buy one get two free! 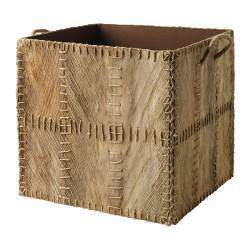 or Kottebo baskets (32cm x 32xm only), only available with the 4x2 bookcase. To get this you need to print the vouchers from the IKEA Family email sent on January 16th. Click the link to the vouchers in the email and it shows your vouchers with a bar code and the card holders name and card number on them, so if you aren't already a member and already getting the emails then I'm afraid there doesn't seem to be an easy way to get this bonus extra! Vouchers valid until end of Feb.